"Tolerance Troubles: Virtue, Vice, or Craft?" "Political Freedom as an Islamic Value"
A panel discussion with Q&A follows the two talks. La Salle University is accessible by public transit via the Broad Street Subway (Olney Transportation Center), the Wister Station on regional rail, and the 26 and 18 SEPTA bus routes. There is free parking available on the street and in lots G and J1. 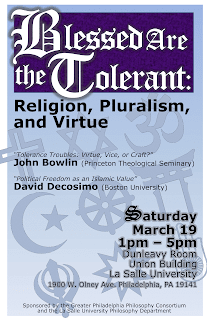 The symposium will be held in the Dunleavy Room, Union Building, 3rd Floor. There will be signage to direct visitors. John R. Bowlin is the Robert L. Stuart Associate Professor of Philosophy and Christian Ethics at Princeton Theological Seminary, where he works on Christian ethics, moral philosophy, social ethics, and the history of moral theology. He is the author of Contingency & Fortune in Aquinas's Ethics (Cambridge, 1999) and the forthcoming Tolerance among the Virtues (Princeton, 2016). 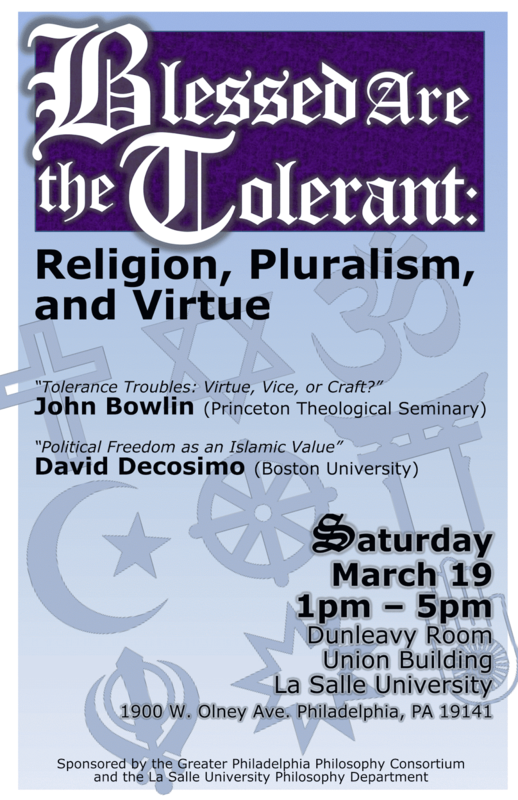 David Decosimo is assistant professor of theology at Boston University where he works on ethics, religion and politics, philosophy of religion, and Christianity and Islam. He is the author of the Manfred Lautenschlaeger award-winning Ethics as a Work of Charity: Thomas Aquinas and Pagan Virtue (Stanford, 2014) and the forthcoming Four Tasks of Christian Ethics. Matthew Puffer is currently Catherine of Siena Fellow at Villanova University. He works on theological ethics with an interest in rival versions of the imago dei and human dignity and their implications for ethics. He will respond to Bowlin's talk on "Tolerance Troubles". Isra Yazicioglu is associate professor of Islamic studies at St. Joseph’s University. She works on interpretation of scripture in the contemporary age, Islamic theology, and faith, reason and science. She will respond to Decosimo's talk on "Political Freedom as an Islamic Value". For more information please contact S. Joel Garver, garver@lasalle.edu.